MARY LAMONT FEATURED IN INTERNATIONAL MUSICIAN! The Mary Lamont Band was invited to perform a rare concert tour in China. Covering some 23,500 miles, the 10-show, 15-day, 6-city tour ranged from giant outdoor concerts in Shenyang and Dalian, to beautiful concert halls like Beijing's Forbidden City Concert Hall and Nanjing's Cultural Arts Center, to You Fu Castle, a large dance club in Xiamen, as well as an intimate acoustic performance in Guiyang. Mary Lamont leads the group with her husband Jim Marchese on guitar, and band members Frank Patterson (drums), Cosmo LoCricchio (bass), and Tom Murphy (rhythm guitar and harmonica). All are members of Local 802 (New York City). The tour had a profound impact on all of the band members. "Mary learned a song in Chinese, and when she sang it, the audience sang along in amazement," said Marchese in a diary he kept of the trip. "They also requested some American songs, including John Denver's "Take Me Home, Country Roads," and original songs from our CD (You Don't Have to Knock, Lammar Records) were also very well received." At one point the band was asked to perform with renowned Chinese saxophonist and teacher Gu Zhao Ming, who has performed in the US with some of his 250 saxophone students. "Twenty of these kids opened a show for us. Music does cut across all borders," said Marchese. The band performed before Chinese dignitaries including Wen Shizhen, leader of the Liaoning Province, and Vice-Governor Zhao Xinliang. They also played for the Chinese ambassador to the United Nations, and Russian and Japanese consulate officials. Their performances received widespread news coverage on ChinaÕs TV stations. Band members were also interviewed for broadcast worldwide. "The Chinese people we met were no different than the folks back in the US," continued Marchese. "They appreciated us, the music, the cultural exchange, and the effort on our part to make them feel at home with Mary and the band onstage as well as off. They also made a genuine effort to make us feel very much at home with them, too." Marchese said the tour was a groundbreaking event for all involved, as nothing similar had ever been done before. "The fact that we play country music made us feel as if we were cultural ambassadors, representing the roots of American music to the Chinese people," he said. "Every visit by Americans makes an impression and we hope that over the next six years other American visitors will make efforts to build relationships so that our athletes get the best welcome possible at the 2008 Beijing Olympics. We felt like we made lasting friendships across cultural boundaries, and weÕve already been invited back to perform." Marchese added that it was particularly gratifying to see people halfway around the world appreciate music that must sound foreign and unfamiliar to them. "Sometimes the spirit and intention with which a band plays can speak straight to the heart of others," he said. For more information on the Mary Lamont Band's upcoming activities, visit the web site WWW. MARYLAMONT.COM. 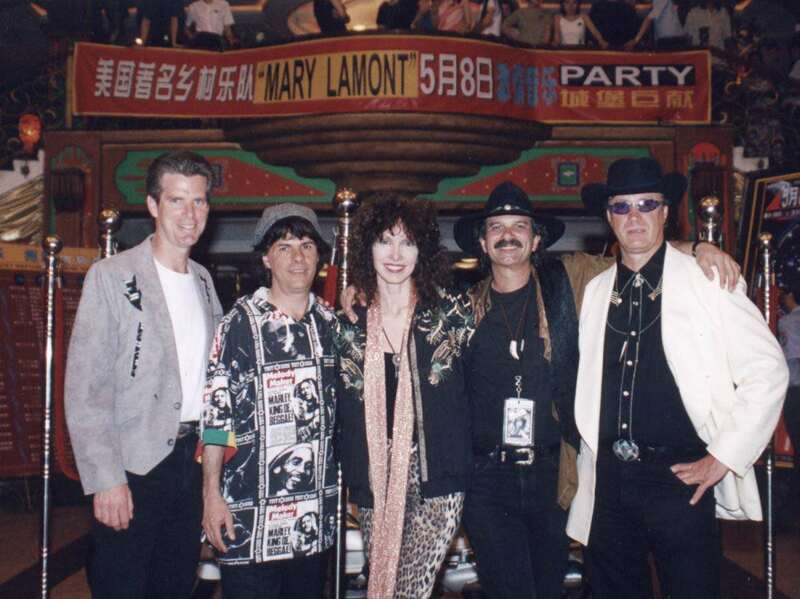 The Mary Lamont Band are (from left): Tom Murphy (rhythm guitar), Cosmo LoCricchio (bass), Mary Lamont (lead vocals), Jim Marchese (lead guitar), and Frank Patterson (drums). All are AFM Local 802 (New York City) members. 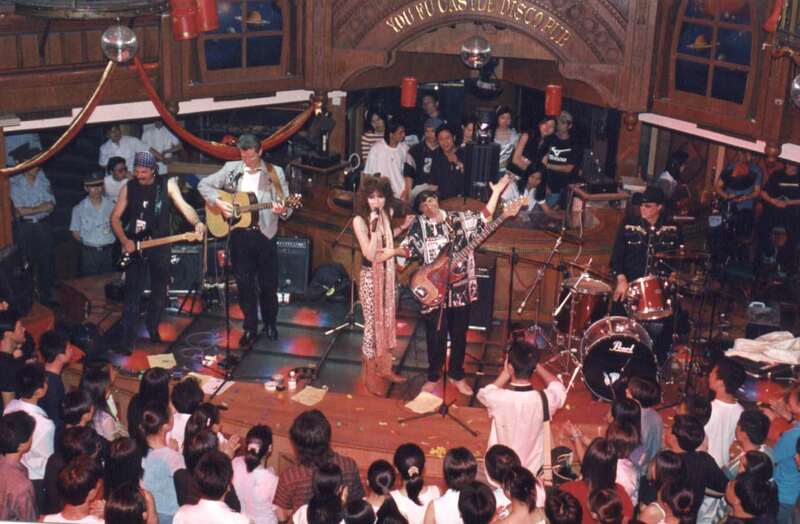 The Mary Lamont Band performing at You Fu Castle, a large dance club in Xiamen, China.